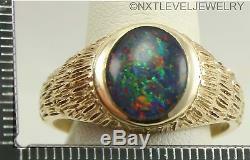 LARGE Vintage 1960's VERY BRIGHT TR UE RA IN BO W RARE Black Natural Opal 10k Solid Yellow Men's Ring. 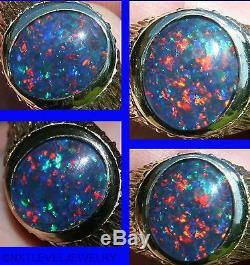 Fantastic VERY BRIGHT Natural TR UE RA IN BO W Opal Triplet with RARE RED/ORANGE FIRE & ELECTRIC GREEN GOLDEN & BLUE FIRE. Take a Closer Look at this Fabulous Ring and Make Us an Offer. 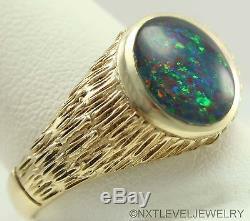 This 7.2 Gram (0.25 Ounce) 1/4 Ounce Original Vintage 1960's 10k Solid Yellow Gold ring is set with a FANTASTIC 12x10mm. 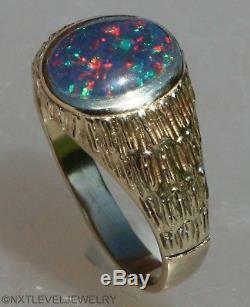 Again this is opal has BRIGHT. W fire, that is visible across the opal. 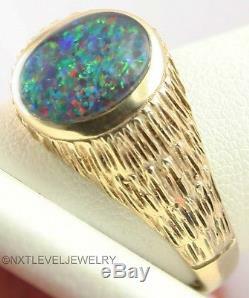 Also the luster of this opal is marvelous. 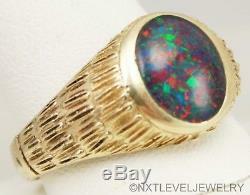 Many opals only exhibit a couple of colors while this fantastic opal displays a RA. This is a triplet opal where the brightest genuine & natural solid opal is mounted on backing of onyx and then covered with a protective clear natural quartz crystal cap. We took quite a few photos of this stunning opal under different lighting conditions to give an idea of the abundance and brightness of the fire and where it occurs. The waves and swirls on the opal in the photos are not blemishes but shadows and reflections as the polished surface is difficult to photograph. 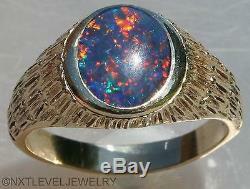 This Opal is a Domed Oval Cabochon Cut. Cabochon refers to a gemstone that has been shaped and highly polished instead of being faceted. 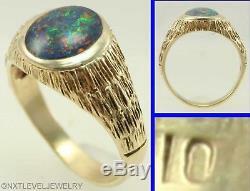 This opal is in PERFECT PRISTINE CONDITION free of any cracks, scratches, or chips. This ring has great bamboo textured shoulders. 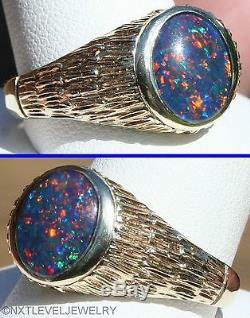 This ring is in EXCEPTIONAL NEAR MINT CONDITION will arrive ready to wear. 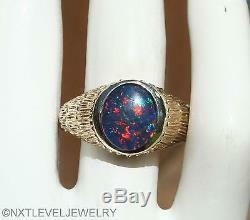 This is an Original Vintage 1960's Men's Ring not a copy or reproduction. Ring Size & Measurements: This ring is a size 13 1/2 and could sized up or down by any competent jeweler. Ring dimensions are 31mm tall and 27mm wide. Ring rises 6mm from the finger. (1 inch = 25mm) 7.3 Grams (0.26 Ounces) Over 1/4 Ounce Total Weight. Gold: This "k" on the "10k" purity mark has worn away but the ring tests as and is guaranteed to be 10k Solid Gold. 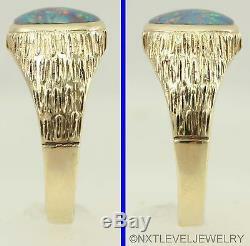 (Again this ring is guaranteed to be Solid Gold not plated or layered). All our Rings will include a FREE Ring Gift Box. Due to differences in measuring devices and the way certain types of rings fit these rings should only be sized in person by your local jeweler. Sizing by your local jeweler is relatively inexpensive and you will have a ring that properly fits your finger. All size 9 rings are not the same. The ring may fit on a mandrel and measure as a size 9 but the way the ring is made, the way the ring has been enlarged or reduced, and the finger type you have may make it fit like an 8 or 10 or worse. Have your sizing done in person for a proper fit. They also have a conversion tool for converting US ring sizes to international sizes. Our rings are CHECKED and CLEANED (unless otherwise stated) by our JEWELER so condition is not a problem. We make every effort to represent our rings accurately by listing the weight of our rings down to the tenth of a gram and dimensions to the mm. Please use these measurements to gauge heft and scale. An explanation of the measurements in the "Ring Size & Measurements" section. The tall measurement is the distance from the bottom or shank of the ring to the middle peak of the gemstone most easily measured when wearing the ring and placing the hand flat on the table and measuring the height of the ring from the table. The wide measurement is the width of the ring from outside to outside at the widest point when looking at the ring from the top. The rise from the finger measurement is the height of the ring from the finger to the peak of the gemstone when worn. Anything substandard WILL be stated in the description. Please read the entire description and terms and if you have a question Please Ask. A Note on Sizing: Due to differences in measuring devices and the way certain types of rings fit, we do not offer resizing on our rings. We encourage you to have your sizing done at your local reputable jeweler. 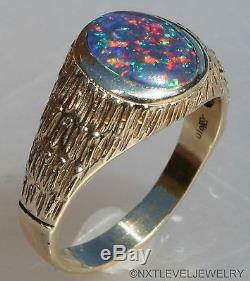 The item "LARGE Vintage 1960's RAINBOW RARE Natural BLACK Opal 10k Solid Gold Men's Ring" is in sale since Saturday, November 25, 2017.